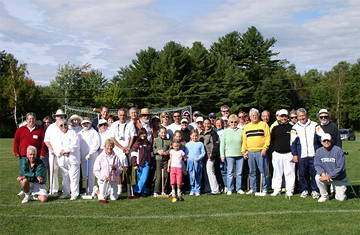 The 2005 USCA New England 9-Wicket Regional Doubles Tournament took place over the September 24–25 weekend in Oakland, in the beautiful Belgrade Lakes region of Maine. This tournament was held in support of the American Red Cross and other charities chosen by the players. Six courts were set up on a soccer field in Pleasant Point Park next to McGrath Pond. There were two flights, Expert and Intermediate/Beginner, with nine teams in each. Games were one hour long with “sudden stop” at the end of the hour. No extra turns—if the score was tied the side closest to a contested wicket got the winning point. This method kept the tournament on schedule. There was no penalty for hitting any ball out of bounds, and the Expert Flight used carryover deadness. Oakland is home to a very large group of 9-wicket croquet enthusiasts and was convenient to many players living in other parts of Maine and New Hampshire. About a third of the entrants were USCA 6-wicket players, the rest 9-wicket players. Several players—both 6- and 9-wicket—ran breaks quite well. The court surface was challenging in places, which made the games quite interesting. 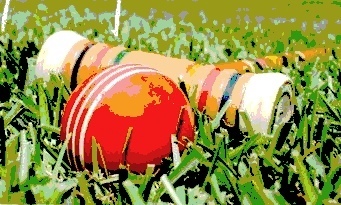 In the playoff phase of the event, two new rules were put into effect: special relief of deadness after an opponent ran the 8th wicket (so long as the clearing side was behind in points), and; a rover had to go through any wicket in any direction to be able to hit any balls it was dead on previously. 9-wicket players dominated in both flights. In Expert Flight, Danny and Jane Bolduc—owners of a full size bentgrass 9 Wicket court in Oakland—beat Scott Van Orman and Todd Smith, by one point. In Intermediate/Beginner Flight, Mary Denise and Gary Ferguson beat Jim and Maire McLaughlin—the only 6 Wicket players to make the finals—by a healthy margin. Many of the players got together Saturday evening at “Steves” restaurant in Waterville to enjoy delicious Maine lobster. Special thanks to Jamie Boulette and Danny Bolduc for their wonderful hospitality and tournament preparation. Teddy Prentis scheduled the tournament and Bob Kroeger directed, both gratis. Look for more USCA 9-Wicket Regional Tournaments in 2006. If readers know of 9-wicket enthusiasts in their area, please conact Bob Kroeger.